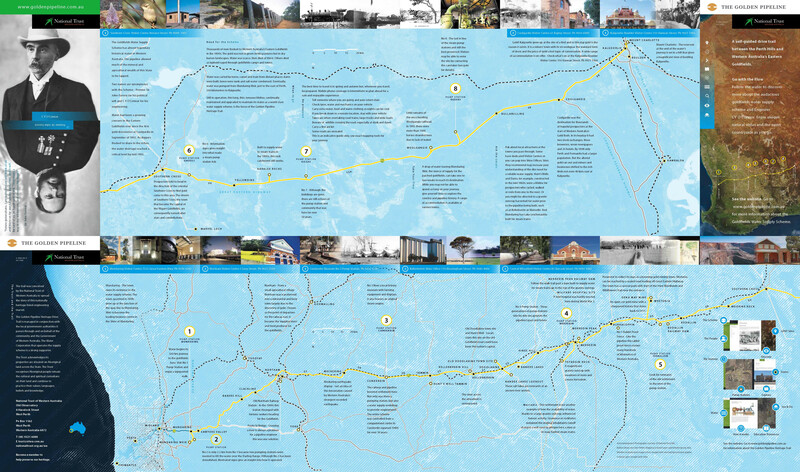 The pipeline has been continually upgraded since it was first laid, but it is interesting to note that 115 years later about 200 km of the original 560 km of locking bar pipe was still in use. By 1932/3 the pipeline was leaking over 1.7 million cubic metres (650 Olympic swimming pools) of water each year. This was a quarter of the water being pumped from Mundaring Weir. The leakage was largely due to external corrosion, particularly at the lead joints. Battye Library. 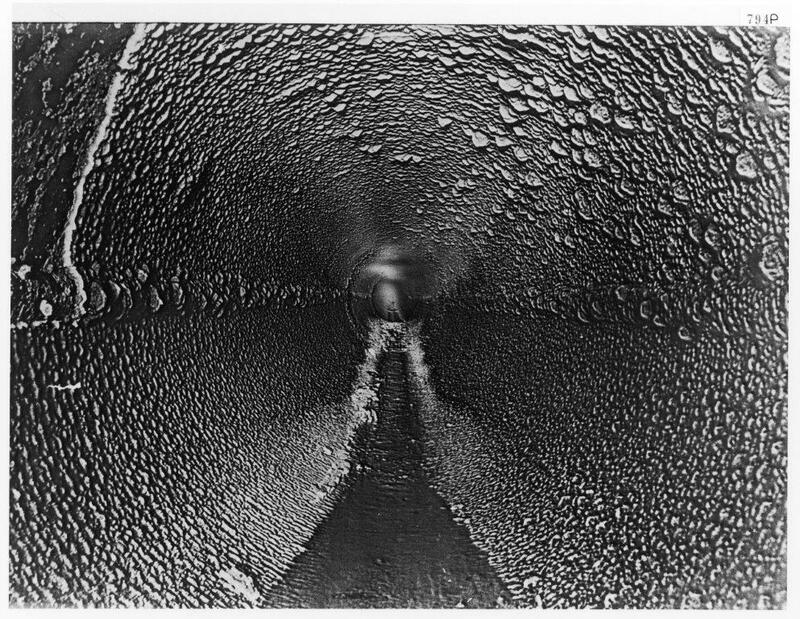 Pitted pipe 1915. Internal and external corrosion was a problem for the outset. It was decided to lift the pipe out of the ground to enable the faulty joints to be welded and get the pipe clear of the corrosive clay soils. About 140 km of new pipes were laid to compensate for the discarded pipe ends and bottoms which had been corroded over the next few years. In 1937, as part of this project when many of the pipes on the Goldfields Water Supply Scheme were being replaced, Frank Mather of Kellerberrin noted that many of the top halves were still in good condition; it was only the bottoms that were corroded. Frank, who was always interested in machinery, invented a machine to cut the locking bar from the pipe. The two good halves were then welded together and a concrete lining spun in. The authorities were initially sceptical but gave him a short trial contract of about 550 m. It proved so successful, with considerable cost savings to the government, that Mather’s Kellerberrin welding company was soon awarded more contracts. During the same period an innovative district engineer at Northam, Norm Fernie, and his assistant, Reg Keating, developed a means of continuous welding which again placed the Goldfields Water Supply Scheme as a world leader in pipeline design with the world’s first continuously welded above ground steel pipe. They started out laying and welding the locking bar pipes with all the locking bars in a continuous horizontal line. By 1937 they were laying the locking bars alternately at 45° above and below the horizontal. However, it was soon found that the upper bar retained rainwater causing an acceleration of corrosion so from then on they were laid with the locking bars 225 mm apart. After World War II, a considerable portion of the Mundaring to West Northam section was enlarged with new steel, concrete lined pipe. This was necessary as branch mains were laid to supply water to farms located within approximately 400 000 hectares of farmland between Northam and Merredin. During the 1950s and early 1960s an increasing area of agricultural land was supplied with water from the pipeline. Many kilometres of locking bar piping were relaid in parallel, and the first of a larger diameter pipe was laid between Mundaring and Cunderdin.